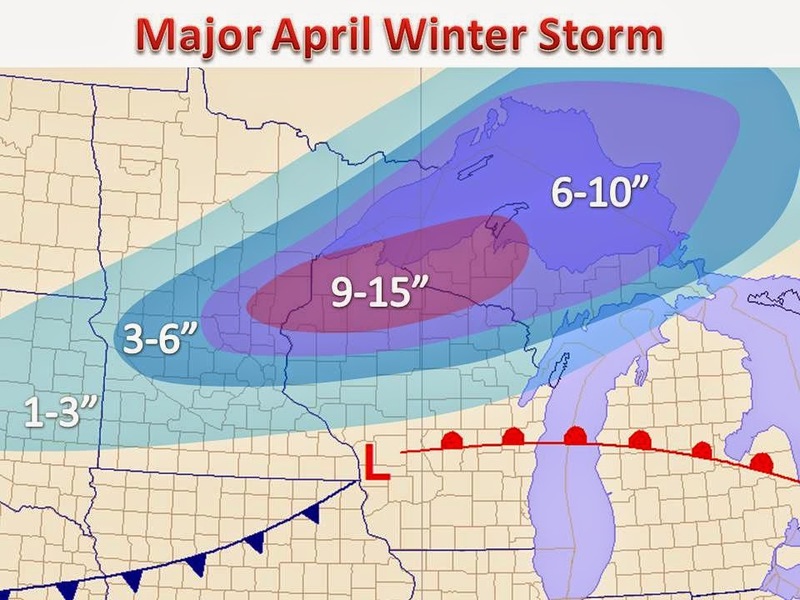 Yet another winter storm will strike the Upper Midwest Wednesday and Wednesday night. The accumulating snow will add up in the same areas that were hit with heavy snow numerous times in the past month. Record seasonal snow totals will be set and tacked onto. Winter storm warning and advisories are in effect. Light to moderate snow had already developed in the Dakotas this morning and will continue to expand and push east throughout the afternoon. The snow will becoming heavy and have a major effect on visibilities. 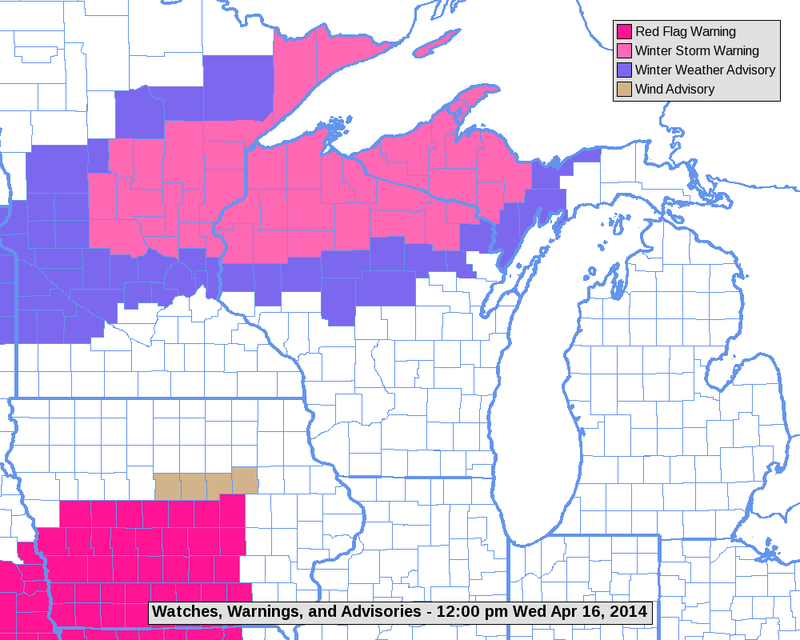 Here are the latest watches/warnings/ advisories from the National Weather Service. A map you might expect for January, dozens of countys are under winter storm warnings where over 6" of snow can be expected. The snow will continue into the night for most and taper off by Thursday morning. Points further south will be affects by a light wintry mix and a cool rain, as the system rides the upper level jet stream to the east northeast. Skies will clear in western areas, and with a fresh snow cover, low temperatures will plummet by morning. In other news, a warm up is in the cards by next week. The jet stream will bump north and with a strong high pressure in the eastern half of the country, the overall flow will be conducive for warm air advection. Southerly winds begin Sunday and Monday which will set the stage for a warm and abundant sunshine week, for the most part. By this time next week May is right around the corner, so wishful and climatology thinking will say that the "warm" weather should be here to stay, but with this winter in mind, anything is possible. Enjoy the Roller Coaster ride of weather the next several days. 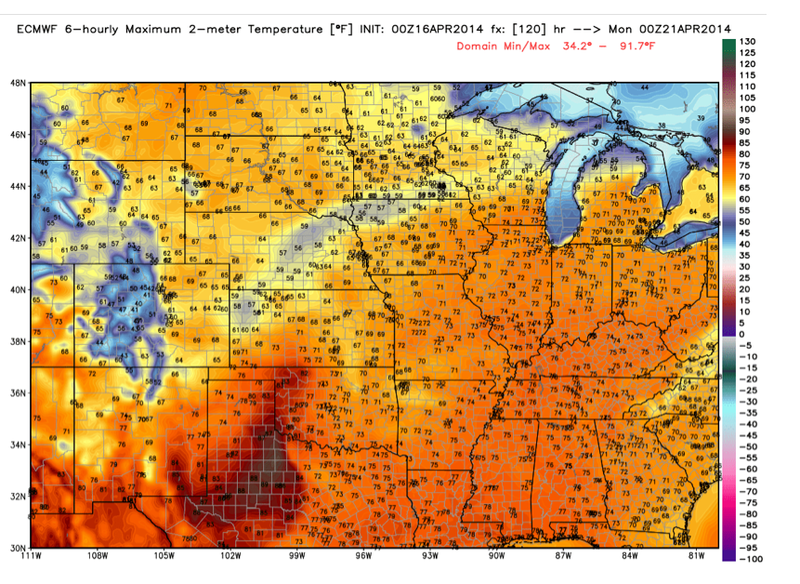 On the right is high temperatures for Sunday off 00z European model run. Other models delay the warm up to Monday. While this model may have slightly over done the warmth on northern fringes, well above temperatures are on the way early next week. When Will Winter Let up and Toss in the Cards?